i have my saturdays pretty much off to a tee now, even if repetition is something of an unvarying factor. though arising mostly around 07:15, sometimes for reasons and sometimes not, there seems always a myriad of adventures, diversions and tasks that require to be slotted into those following hours. i cannot claim uniqueness in this, for no doubt those in rather close proximity to a brace of superstores or maybe worse still, a garden centre, are less than well-placed to resist the imposition of family necessities prior to or maybe even in place of a thoroughly necessary bike ride. islay is less mechanised in that manner, for there is really no sensible way that our local supermarket could be pre-fixed by the word super, and rarely are there enough products on its shelves to involve more than an half hour shop. i believe that is what might technically be regarded as a result. of course, shopping cannot be specified as the sole interlocutor of a saturday morning, but if push comes to shove, always assuming mrs twmp to be possessed of a benevolent disposition, chores such as vacuuming can be carried out a later time. the route varies little. i can pretend that i have set off in a quest to reach port ellen in the south, but once the doubters have been placated, 'tis but a simple matter to slip off to the left past the airport and head upwards to the high road. i cannot deny that there is a simple satisfaction to be gained from chuntering along the abbatoirenberg forest road, with its graciously uneven surface imparting a sense of achievement, even if such only exists in the mind of the beholder. if the imagination will stretch to greater accomplishment, i can inhabit polka dots up to ballygrant via storakaig, but more generally hunger grabs the upper hand, and the bike takes a left and then another to head for a cheese and chutney sandwich accompanied by still the finest soya cappuccino money can buy. if ever there were a time for cycling during which one could throw aside the need for any degree of sartorial exactitude, it would clearly be saturday morning. those in their tin boxes are more intent on the shopping that no-one actually wants to do, and at this time of year any remnants of velocipedinal activity is concentrated on making it through the unexpected headwind to reach the ferry in time. no-one has any time to appreciate the well-dressed cyclist. on the basis of yesterday's convoluted ride to debbie's, that was a real shame. swiss-based cervo rosso, like many in their particular line of work, have not rested upon their considerable laurels, having brought themselves from the obscurity that predictably accompanies any new kid on the block, to a level that places them on the same road as many of their competitors. 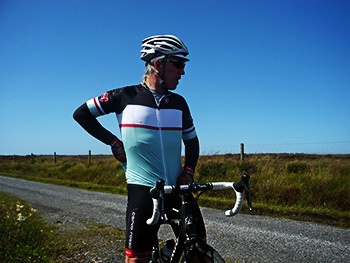 for summer 2012 they have brought the corsa s3 jersey to our attention, decorated in three judiciously chosen colours, very much in keeping with the unique style cultivated in their short existence. from a choice of white with black/red, mint or a decidedly attractive light blue, again accompanied with the same black/red, cervo rosso's carlyle ware sent the limited edition mint. sometimes the words limited edition are more of a temptation to purchase than inhabiting the strict definition of the phrase, but the cr website states 'The S3 CORSA in Mint is a limited edition production and is only while stocks last' and at the time of writing, there were only eight left in stock. by the time you read, there could well be an empty space on the shelf. islay occupies its own micro-climate, ignoring the forecasts provided by all and doing its level best not to take on the meteorological clothing of our near neighbours in kintyre and northern ireland. at present, it's all sun, sea and sand over here, with an ambient temperature considerably higher than was expected, something that truly favoured this particular jersey. the top section is composed of a perforated polyester, doing its level best to keep the athlete within (who laughed?) as cool as he'd really rather like to be. a full length zip is ideal in such warm conditions, allowing a chance to cool while sitting at the coffee bar in debbie's. by golly it was hot indoors. the sleeves are of a well-chosen length, a tad longer than regular, but very welcome; i am nothing if not a complete wimp when faced with the prospect of several hours in the saddle around the principality. apart from the showers pass waterproof stuffed in the middle pocket, i was reluctant to be out and about without a pair of cervo rosso armwarmers, and the extra few millimetres on each sleeve obviates any likelihood of skin on view between the end of one and the start of the other. inside the cuff is a series of gloopy dots preventing the sleeve from heading upwards if its elasticity is unnecessarily ruffled. 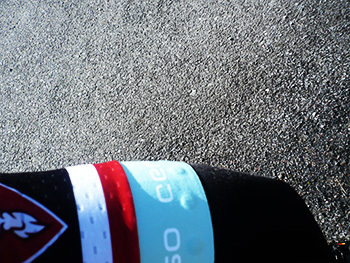 the jersey's hem relies principally on elastic to keep it firmly planted across the bibshorts. in practice, the jersey is almost not there, by which i mean it accomplishes its job almost transparently. no matter my sprinting prowess (that laughing is going to have to stop), climbing acuity or downright rouleur-ness, there was no restriction of movement, and in my opinion, that's exactly what a cycle jersey ought to be doing for its owner. however, it is not without the occasional fault, none of which substantially reduce the return on investment, but i feel are worth pointing out. firstly, there are only three rear pockets, when i think we're pretty much all agreed that a fourth zipped variant, if not an actual necessity, is certainly highly desirable in the age of mobile phones, car keys and coffee money. the second was brought forcibly to my attention when zipping up on leaving deb's. the collar bears no zip garage, exposing the innards of the zip to the remarkably sensitive skin on my neck. ouch. it may be unfair to level this accusation purely at cervo rosso; they are not alone in this omission, and removing minor portions of skin is not something likely to be repeated after the first nip, but a zip garage would obviate the problem at source. my last carp is purely personal and one i brought to the surface when reviewing the cr strada doppio 2.0. many a commercial concern has a slogan used to identify itself from its peers and competitors, something almost taken for granted. however, it is my contention that these slogans should inhabit only websites, catalogues or garment labels. i'd really rather they didn't occupy a black stripe down the centre of the middle pocket. 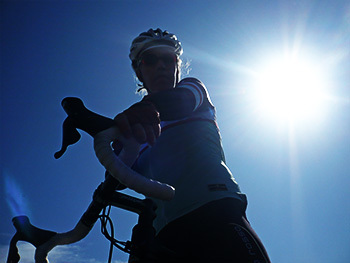 cervo rosso are correct; it is my ride, but can we keep that to ourselves please? 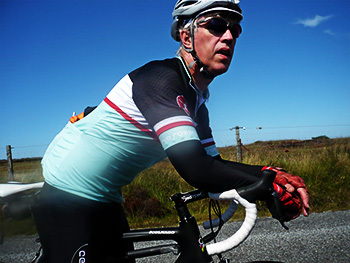 aside from my superficial carping, these do not seriously detract from what is a truly excellent cycle jersey. 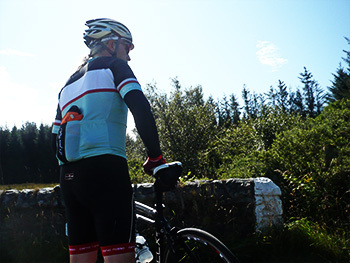 though geared predominantly towards summer riding, the composition ensures that it will gain additional seasonal use under the aforementioned strada doppio or in colder weather, and intermedio jacket perhaps using the armwarmers to mediate the temperature. if you're really, really quick, you might just nab one of these limited edition mint editions, but if not, the blue or white are surely more than equible alternatives.